"Fresh grouper is my absolute favorite. 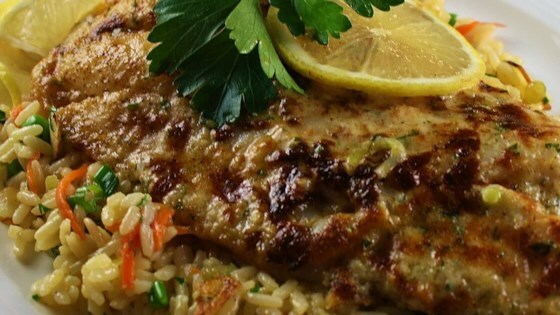 It is a mild fish and this recipe may entice even those who don't like fish to make it a favorite. The recipe is super easy and can be served with a minimum preparation and cooking time. Perfect for a warm summer evening supper. Garnish with lemon twists and parsley before serving." Place the grouper fillets on a greased baking tray. Brush them with lemon juice. In a small bowl, stir together the Parmesan cheese, butter, mayonnaise, hot pepper sauce, salt and pepper. Set aside. Broil the fillets for 4 to 6 minutes, until they can be flaked with a fork. Remove from the oven and spread the cheese mixture on top of fillets. Return to the broiler for an additional 30 seconds, or until the topping is browned and bubbly. This was so very good. I baked my fish first at 400 degrees for about 12 minutes then put on topping and broiled for about two minutes. Turned out perfect. Thanks for sharing. This dish was exceptionally easy to make and absolutely spectacular!!! Great flavor, would swear it from an upscale restaurant! Thanks for the awesome recipe! We went fishing and caught 100lbs of Mahi and came home looking for a recipe. I know this one says Grouper, but we tried it anyway... OMG it was so good and so easy. A Must Try!